A group of high school cheerleaders in Texas has won a victory for religious liberty. 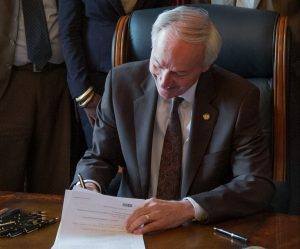 Yesterday the Secretary of State certified a proposed constitutional amendment legalizing four casinos in Arkansas for the November 6 General Election ballot. The amendment, Issue 4, would convert the racetracks in Hot Springs and West Memphis into full fledged casinos, and it would let casinos open in or near Russellville and Pine Bluff. I will vote ‘no’ on the casino amendment because I have always opposed the expansion of casino gambling in Arkansas. The campaign to pass Issue 4 largely has been bankrolled by the Quapaw and Cherokee tribes in Oklahoma, which together have donated more than $2 million to the casino measure. Last week the Arkansas Department of Transportation criticized the advertising tactics the measure’s backers are using. Campaign material in support of Issue 4 indicates that casino tax money will provide funding for highway improvement. However, the amendment itself does not earmark any casino tax revenue for highways. Ultimately, state and local officials will decide how that tax money will be spent.